We make 100% real fruit smoothies that taste awesome and promote a fun and healthy lifestyle. We’re not a big chain, we’re owned by families and individuals in the cities we blend in. We just believe in eating right and having a positive attitude on life. Juice Stop is where that comes together for us, proving that it IS possible to eat healthy and still eat great. We love Juice Stop smoothies and want to share that with you. So stop by for a fast snack or breakfast and and fill up on a delicious fruit-filled smoothie. 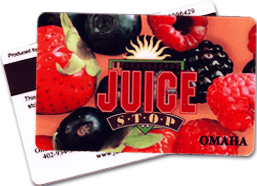 Giving a Juice Stop gift card is like handing a freshly picked arrangement of fruit to someone that will never expire and doesn’t need to be refrigerated. This is no ordinary piece of plastic. You already buy smoothies, why not collect some bonus rewards? Our loyalty rewards program is our way of saying “Thank You” for being a great customer. Get a free 24oz smoothie just for signing up!